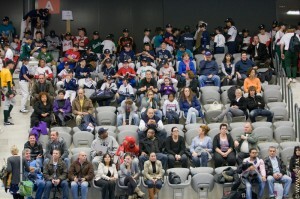 “Rotterdam certainly will welcome back the Big Leaguers Tour in the next coming years!”, concluded Hans Zoethoutmaar, deputy director of Rotterdam Topsport, when he was briefly interviewed by Mister-Baseball upon departure from his Topsport Centre, where the first multiple Big Leaguers Clinic in Rotterdam was hosted last Tuesday. 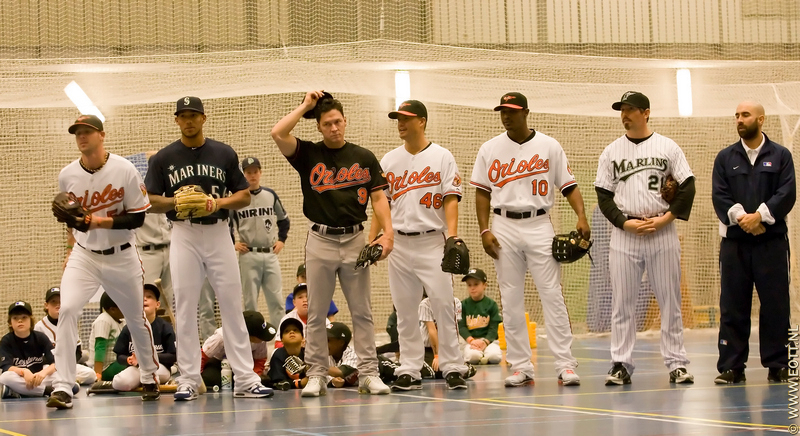 The first single Big Leaguer Clinic in Rotterdam took place in 1979, when Boston Red Sox pitcher Win Remmerswaal accepted the invitation to give an indoor training for approximately 50 young pitching talents. 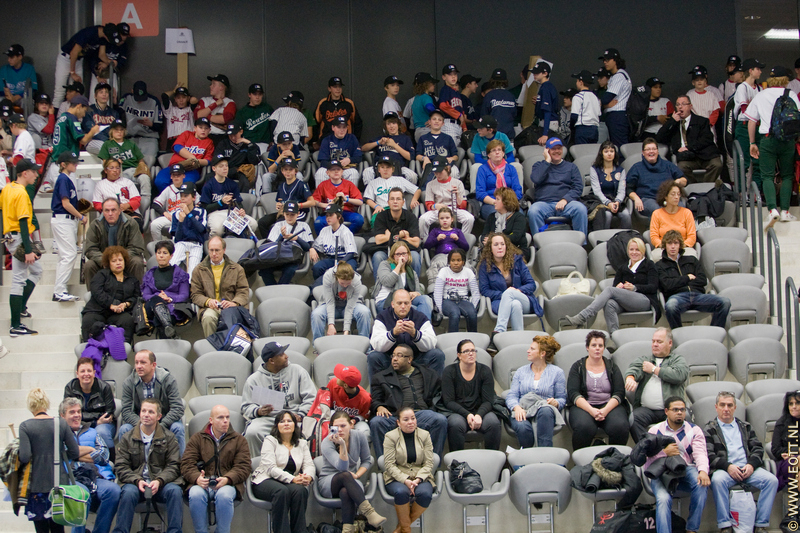 Alike on Saturday in Eindhoven and on Sunday in Haarlem, roughly 300 boys from the Netherlands attended the Rotterdam meeting at 17.00 h, organized by Dutch pitcher Rick van den Hurk, pro player with Baltimore Orioles, together with his father Wim van den Hurk, director of MLB sponsored baseball academy in Eindhoven. Rick was helped by Major League friends Kyle Barbour (conditioning specialist), Brady Anderson (Baltimore Orioles), John Baker (Florida Marlins), Adam Jones and Jeremy Guthrie (Baltimore Orioles) and newly debuted Dutchman Gregory Halman (Seattle Mariners). They will also appear in Saturday’s clinic in Antwerp (Belgium). The famous stars at Major League sky over Rotterdam contrasted with the many little boys, each with the uniform of their clubs. Four of the clubs play in Dutch Hoofdklasse: Sparta-Feyenoord and Neptunus from Rotterdam, ADO from The Hague and HCAW from Bussum. During the two hours clinic we saw young players from Magpies in Almere and from UVV in Utrecht, outgoing and new coming Hoofdklasse clubs. Other clubs represented in the Big Leaguers clinic were Seven Hills from Zevenbergen, Blue Hitters from Puttershoek, Islanders from Oude Tonge, Athletics from Hellevoetsluis, Euro Stars from Capelle aan den IJssel, Rowdies from Ridderkerk, Birds from Zoetermeer, Hawks from Dordrecht, Braves from Gouda, Spikes from Spijkenisse, Gophers from Maassluis, Holy from Vlaardingen, Blue Birds from Delft, Orioles from Bergschenhoek, Storks from Den Haag, Schiedam from Schiedam, Wizzards of BoZ from Bergen op Zoom and Saints from Rotterdam. A few of the young Dutch players were girls. Two halls of Rotterdam Topsport Centre were fulltime occupied by the hundreds of excited players, subdivided in small groups rotating from corner to corner in order to learn fulltime from the teachers. MLB players were technically assisted by famous local players such as Eugene Kingsale, Diegomar Markwell, Berry van Driel, Raily Legito, Dwayne Kemp and Kevin Heijstek: all members of Neptunus and Dutch national team. Ex-player Evert-Jan ‘t Hoen and injured infielder Marvin Bleij (Neptunus) helped the Van den Hurk organization hosting guests. He guided the old fans to the stands of the two halls, mainly parents of the pupils. Among the parents we recognized famous fathers like former pitcher Ken Brauckmiller and international umpire Henri van Heijningen.